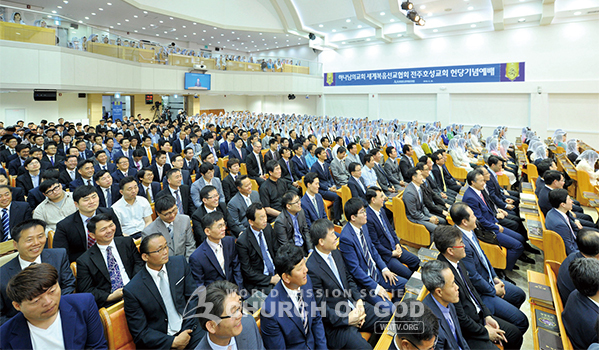 On May 25, the dedication services were held for two churches in Jeonju, the largest city in the North Jeolla Province of Korea: the Hyoja Church, located close to North Jeolla Provincial Office, and the Hoseong Church, situated in Hoseong-dong where large-scale apartment complexes proliferate. 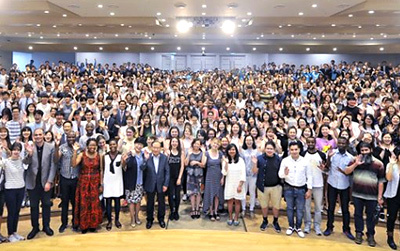 On June 19, the dedication service was held for the Nakyang Church in Uijeongbu, Gyeonggi Province. The members in both provinces participated in the services with joy and pride of dedicating the temples to God and engraved God’s will upon their hearts. Mother repeatedly praised the united efforts of the members until the new temples were established and blessed all the Zions in both provinces as well as the three new churches abundantly. Mother hoped that the virtues such as love and unity may continue in the temples built according to the will of God. “You may have difficulties while keeping your faith due to jobs, studies, housework, and so on. But the present sufferings are not worth comparing with the glory of heaven. Looking forward to the rich heaven’s glory, let’s cheer up!” Mother encouraged everyone. During the dedication services for the two churches in Jeonju, General Pastor Kim Joo-cheol quoted the name of the Hyoja Church (hyoja means a devoted son in Korean). “A hyoja readily obeys his parents. Jesus showed the example of how one man’s obedience saved the many. Let’s all become spiritual hyojas and obey the word of God completely,” he asked earnestly. 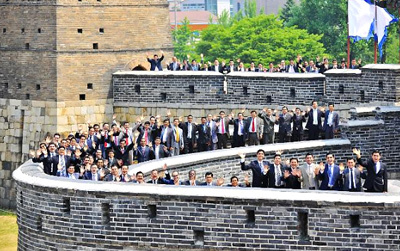 He also wished that all the brothers and sisters would be united to flash the light of salvation at 65,000 citizens of Jeonju and 1,850,000 residents of North Jeolla Province (Ro 5:19; Heb 5:8; Jn 12:49; Heb 4:12–13; 1 Pe 1:23–25; Isa 60:1–8). At the Nakyang Church in Uijeongbu, he delivered a sermon titled Mother, the Source of the Water of Life. “The water of life that is necessary for the salvation of our souls comes only from Jerusalem Mother. These days, many souls who are thirsty for the water of life are streaming to Heavenly Mother from all around the world including remote alpine areas of the Himalayas, the Amazon Rainforest, and Alaska the land of the Inuit. Let’s realize why God has established Zion in this area and proclaim good news, so that the water of life may well up in the new temple,” he said with emphasis (Rev 22:17; 21:9–10; Gal 4:26; Eze 47:1–10; Rev 22:1–4). It has one basement floor and three floors above ground, and its clean exterior stands out. 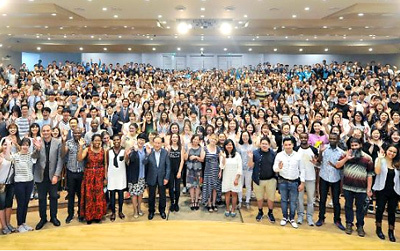 By the compliment of the neighbors that the surroundings got brighter as the Church of God was built there, the members are going at full speed ahead for volunteer services and missionary work, being determined to shine God’s glory more brightly in Jeonju. “God has given us a great blessing, so I also want to be a spiritual filial child who only gives joy to God,” “I will diligently find spiritual filial children who will follow God’s will with all their hearts.” The members’ determination showed their will to become hyojas. When it comes to the city of Jeonju, many people are reminded of bibimbap [Korean mixed rice]. The Hoseong Church is equipped with a variety of facilities. It is perfect for the members to strengthen unity and to communicate with the residents just like bibimbap which makes a good taste with many ingredients. It has a four-story main church building as well as two annexes. Events such as “Our Mother” Writing and Photo Exhibition and the blood drive have been held there one after another, which proves that the church has already settled as a place to communicate with the local residents. Over 2,400 members attended the dedication service, and people from all walks of life and the local residents sent congratulatory messages. Since 2005 when the development of the residential area was confirmed, Nakyang-dong that was mostly farmland transformed into the largest residential and commercial area in Uijeongbu as many apartment complexes and shopping malls were built. The building with four floors and a basement has a two-storied worship hall, a reception room, audiovisual rooms, multipurpose rooms, and so on. Its architecture maximizes space utilization as the semicircle wall goes along beautifully with the adjacent winding road. There are a stream and a trail behind the church, which draws many residents to the church. As there are many apartment construction sites, the members make efforts to carry out cleanups regularly to beautify their neighborhood.